ANGULAS AGUINAGA, S.A., was founded in Aguinaga (Guipúzcoa-Spain) in 1974 to market elvers, a sector in which it became the leading company. In the late 80s it became clear the biological crisis affecting the elver market. Angulas Aguinaga, S.A looked for possible substitutes started a research at the Instituto del Frío from the Consejo Superior de Investigaciones Científicas (C.S.I.C.). Spanish patent Nº 8901508 and European patent Nº 90500037.8 were taken out, allowing us to create the current “elver substitute” based on surimi which our company commercialises under the brand name of, among others, “LA GULA DEL NORTE” and which has now became a common product on Spanish tables. Angulas Aguinaga, S.A has always been an innovative company committed to the continuous development of new products. As a result of this policy, Angulas Aguinaga, S.A develops and markets a range of surimi-based products – “KRISSIA”. These products are similar to crab stick meat, lobster tails, shredded crab and crab slices. For further description look up News item on Prix d'Elite. 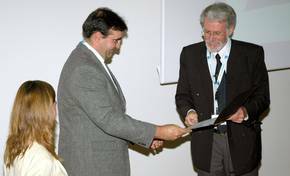 At the third Open SEAFOODplus Conference 29 May to 2 June 2006 in Tromsø, Norway, the Certificate of Associate Membership was presented to Jose Luis Hurtado of the Angulas Aguinaga company. The Project Leader, Mercedes Careche, from the project to which the associate is in contact with, CONSUMERPRODUCTS, introduced the associate to the audience. Mr. Hurtado gave a presentation the following day with the title: Innovative seafood product development from a SEAFOODplus Associate Member's point of view. Associated members of SEAFOODplus receives a Certificate of Membership as proof of their status when membership has been granted by the SEAFOODplus Council. The certificate shown was received by Angulas Aguinaga at the Plenary Session of the Third Open SEAFOODplus Conference in Tromsø, Norway.